It sure got Geordi excited. Despite an accidental leak on Reddit a few days prior to E3, Star Trek: Bridge Crew was one of the highlights of the Ubisoft conference. When LaVar Burton gets incredibly excited about something you know it's got some value, and watching the Trek alums wax praise about the game was fun in itself. Co-op fans might finally have the VR experience we've all been waiting for. You might be tempted to write this one off as another one of those barley interactive "VR Experiences." Well, not to worry! "At first, people might think you're just pushing buttons and that's lame," David Votypka, the senior creative director down at Red Storm said in an interview earlier this week. "However, it's what the buttons do that makes it cool. You're on a Federation starship firing torpedoes, raising shields and turning on the red alert. That's an awesome sensation, especially when you're playing in VR with friends." So, yes, you're still "just pressing buttons," but you're doing so in an actual video game as opposed to a scripted visual experience. "The game is more about how you and your crew approach situations. It's not binary," Mr. Votypka went on to say. Color me interested! There's no word on if VR is required or if a separate version of the game will be released not requiring head gear. 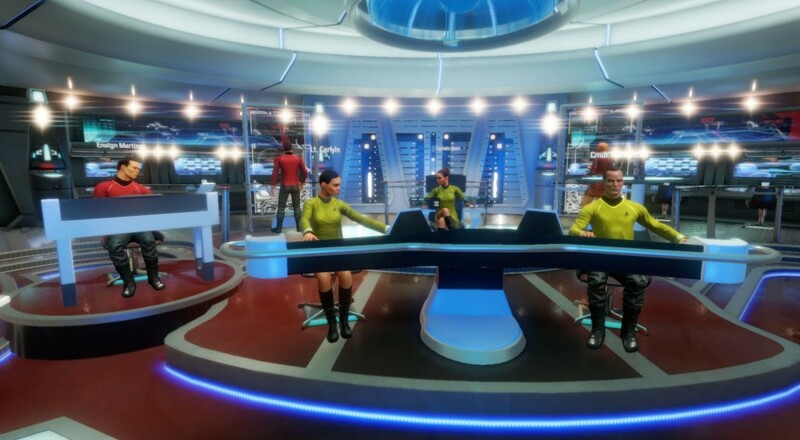 We will know more in the coming months as Star Trek: Bridge Crew is slated for a fall release this year for Oculus Rift, HTC Vive, and PlayStation VR. Page created in 1.5273 seconds.